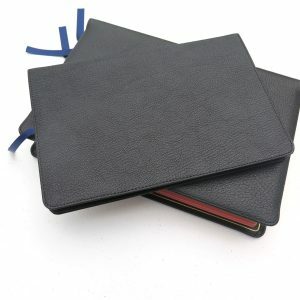 Black Buttero Calfskin. See pictures here. 11 point Milo font PDF of the text. 16 pages of extensive Schuyler Maps – edited by Dr. Barry J. Beitzel – the most extensive set in any of our Bibles. 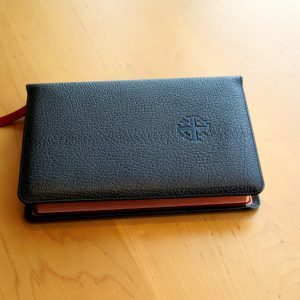 This review is for the Schuyler Quentel NKJV in black calfskin leather. As a point of reference, I am reviewing this in comparison with the Schuyler Quentel NKJV in black leather-lined goatskin leather. 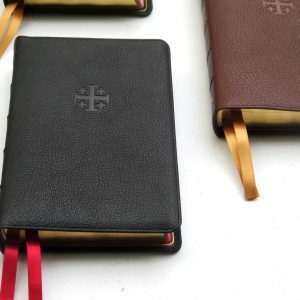 Let me start by saying that the calfskin and the leather-lined goatskin Schuyler Quentel NKJV are identical in dimensions, format, content, and thickness of paper. The most obvious difference is that this Bible is bound in calfskin leather (paste down) while the other is leather-lined goatskin. 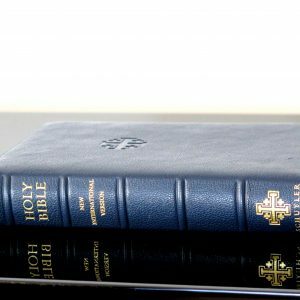 However, there are significant differences between the two Bibles. 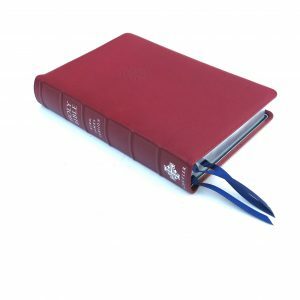 First, the calfskin NKJV Quentel lays truly flat even at the table of contents whereas the leather-lined goatskin does not start laying truly flat until somewhere in Deuteronomy-Judges. The winner here is the calfskin NKJV Quentel. 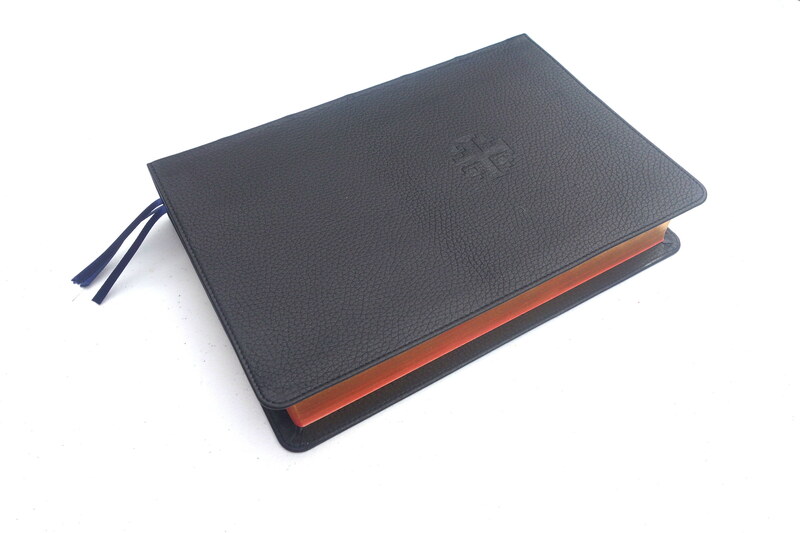 Second, the calfskin NKJV Quentel’s cover is stiffer than the leather-lined goatskin. 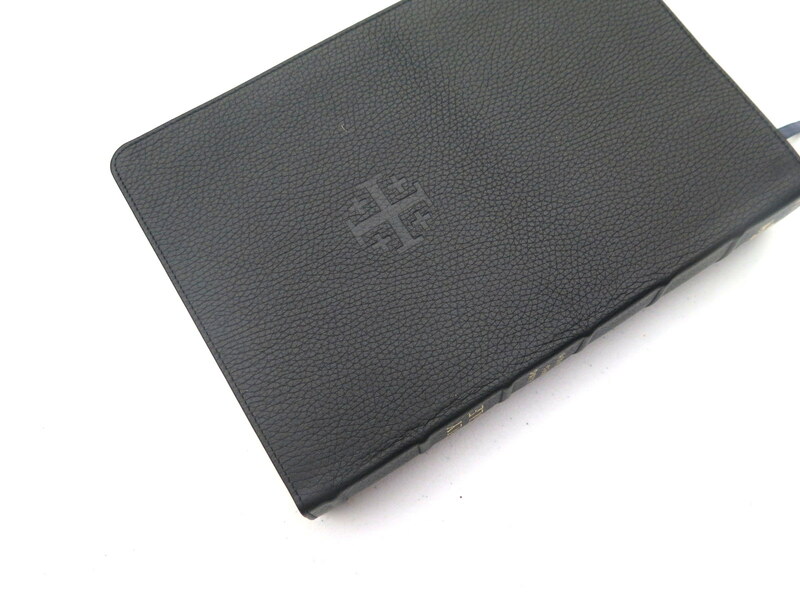 However, when you hold the calfskin Bible in your hand, the pages droop similarly as the leather lined goatskin. Neither has an advantage over the other. I do want to point out that the calfskin hinges more beautifully than the leather-lined goatskin. Third, while the yap of both the calfskin and leather-lined goatskin is the same, the absence of the gold gilt around the yap on the calfskin makes the yap on the calfskin appear wider. I cannot say whether the absence of the gold guilt is a plus or a minus (I prefer it without having a gold gilt around the yap). What I can say based on my observation is that the absence of the gold gilt around the yap gives the yap on the calfskin a wider look. Lastly, the calfskin costs $120 while the leather-lined goatskin costs $220. 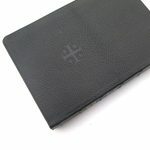 The clear winner here is the calfskin edition, especially since the benefits of the calfskin as described above far outweighed the leather-lined goatskin. 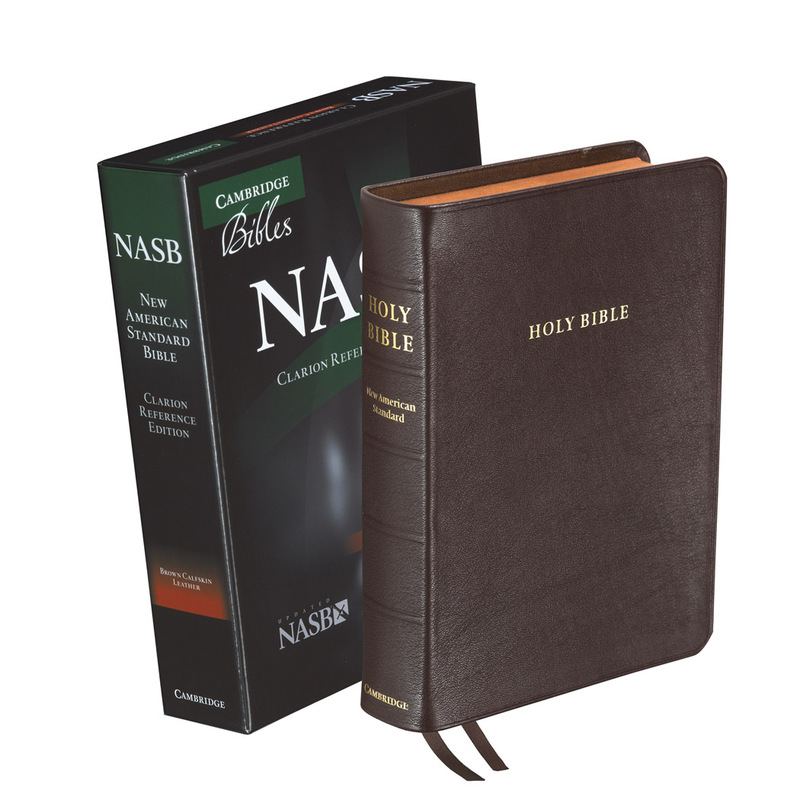 In other words, you are getting a better Bible with the calfskin edition for a much lesser price. I love my calfskin NKJV Quentel. This will be my Bible until I die or until the Lord returns. I ended up selecting the black leather, black letter calfskin because the goatskin in black letter was out of print. I am blown away how amazing this Bible is. 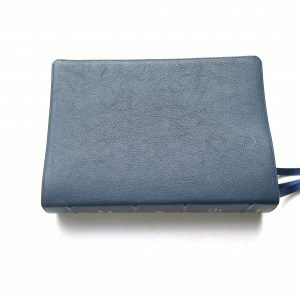 The leather is soft. For $80.00 less than the goatskin, you can’t go wrong. The only problem I have with this Bible is that it is so well made, so beautiful that I am afraid to really use it and take it places. It’s like a show car that sits in the garage and you don’t want anyone to even breath on it. It is fantastic! 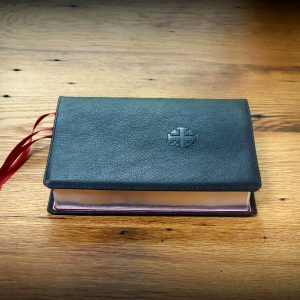 The only other premium Bible that I have is a Cambridge Wide Margin in Goatskin. And the Quentel in Calfskin blows it away as far as beauty, paper, and print. The only sacrifice is the Wide margins. 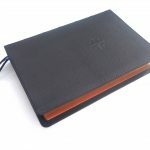 If I could sum up my first impressions I would say the Quentel in Black Calfskin is elagent, well made and designed to be read with amazing print and it’s only $105.00 Schuyler has done it right!!! I got this Bible to replace one where the pages had started falling out. I wanted a higher-quality Bible that would last the rest of my life. 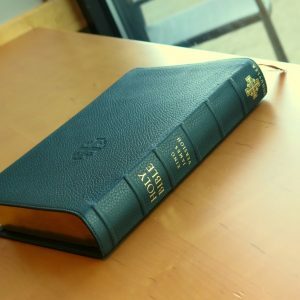 I had never bought a premium Bible before, so I wasn’t sure what to expect. What I received was the higher-quality Bible I was looking for, but also it’s the best Bible I have ever had. I specifically chose Schuyler for the 11-point text, since the other publishers have smaller print. I almost did not buy this Bible when I saw 2K/Denmark had typeset it. The only other typesetting I’ve seen from these people is the new CEB, which I dislike. But the samples I saw online made me give the Bible a try. The text is almost perfect for me. It’s not too big and not too small. The words are wide and comfortable, not cramped. The paper is not too bright white, but contrasts well with the text. This Bible is the most readable one I’ve ever had. Little things mean a lot, and impressed me. Putting references at the bottom of the page means that a lot of the poetry is more readable because the columns are wider. The line breaks are also better in the poetry. 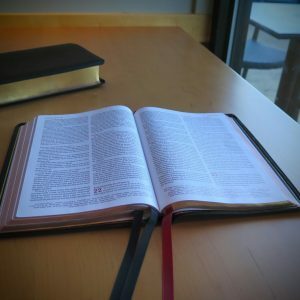 Other Bibles will allow their typesetting software to do poetic line breaks, and sometimes one word is continued to the next line by itself (or even the rest of a continued word), which is clunky-looking. This typesetting looks like someone hand-edited the poetic parts to make them look readable on the page. 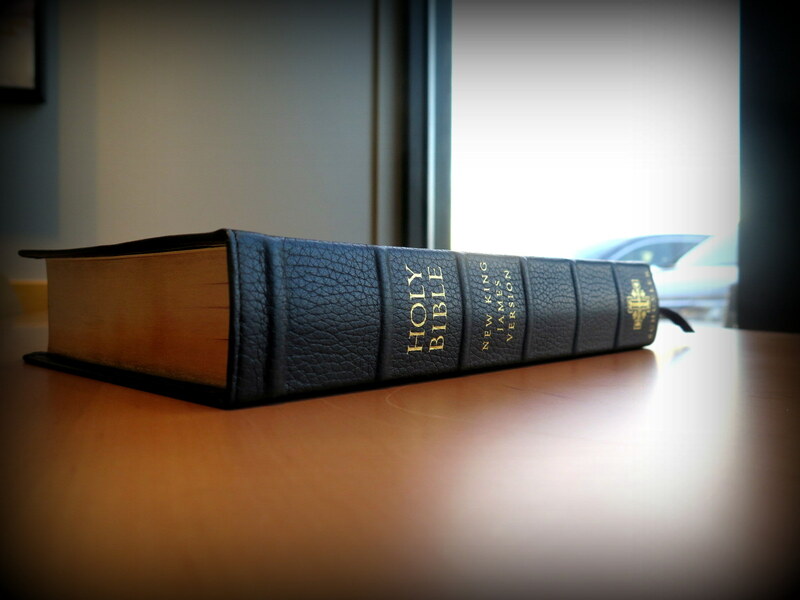 The construction quality was my main concern, and this Bible is well crafted. The Bibles I’ve had are not well made, and the pages start falling out on either end. This Bible looks built to last. 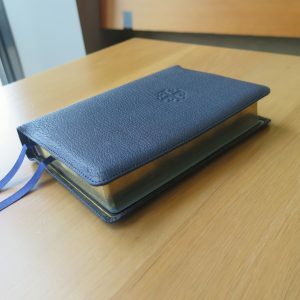 When opened, the Bible lays flat with no problem. I was actually holding my old Bible in a way to keep the pages from breaking loose even more, and I had to unlearn that with the new Bible. Schuyler produced a Bible that exceeded my expectations. I didn’t know what I was going to get with my first premium Bible. But it’s a Bible I will keep the rest of my life.